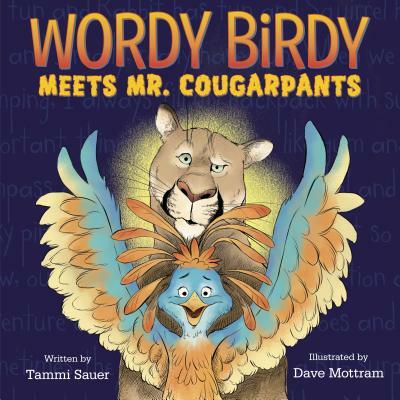 Wordy Birdy and her pals are back, in a hilarious new story with a truly ridiculous villain—from beloved author Tammi Sauer. Wordy Birdy and her pals are heading on a camping trip, and our favorite chatty bird is all ready for a big night under the stars. ("I brought pickles and bean burritos and more pickles and mashed potatoes and some pickles and . . .") But the friends soon find themselves in hot water when the dastardly Mr. Cougarpants stalks their campsite. Can Wordy Birdy talk them all out of this pickle? Grab your pack, grill up a s'more, and find out! Author Tammi Sauer (Chicken Dance, Nugget & Fang) will keep young readers and their parents giggling with this funny, chatty, boisterous adventure about the importance of listening AND the importance of speaking up for your friends! TAMMI SAUER is a full-time children's book author who presents at schools and conferences across the nation. She is the author of numerous picture books, including Wordy Birdy, Cowboy Camp, Chicken Dance, Nugget & Fang, and Mary Had a Little Glam. In addition to winning awards, Tammi's books have gone on to do great things: Chicken Dance: The Musical is currently on a national tour, and Your Alien, an NPR Best Book of 2015, has been published in Italian, Spanish, Korean, and French. Tammi and her family live in Edmond, Oklahoma. Visit Tammi online at tammisauer.com and follow her on Twitter at @SauerTammi. DAVE MOTTRAM is a designer and illustrator working in Ohio. He has illustrated Wordy Birdy; Race Car Dreams, which Kirkus called “clever, bouncy fun”; and Oy Vey! Life in a Shoe. He also works with the Khan Academy on educational apps for young children. To learn more about Dave’s work, visit him at davemottram.com.